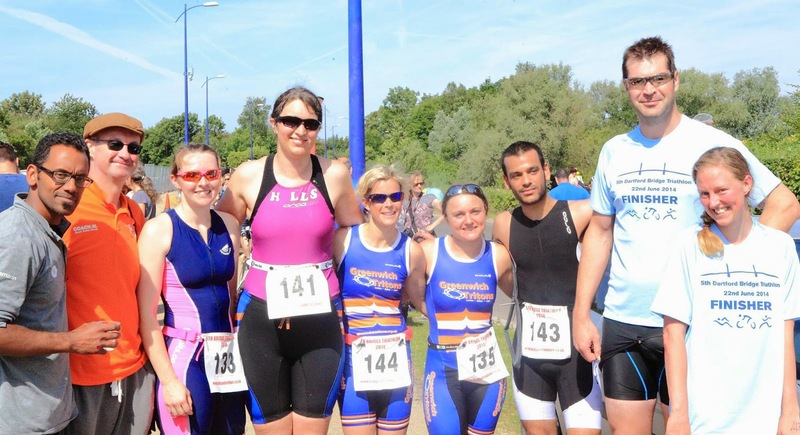 A little bit of back story - my first ever triathlon was the Virgin London super sprint at the Excel centre in September 2012. I then entered the Virgin London sprint distance for 2013, only to discover that this was the same day as my best friend's wedding, where I was due to be bridesmaid. So I deferred my entry to this year. My aim was to enter the standard distance in 2014, but I wanted to do two standard distances this year. I couldn't find a good one to do in September, so when everyone started entering the Bridge Triathlon I posted on Facebook - do I enter the standard or the sprint? Everyone told me to enter the standard, so I did. I've stopped calling it an Olympic, as non-triathletes seem to assume this means I'm actually an Olympian. Ha. The distances are 1500 m swim, 40 k bike ride and 10 km run. "think - one more stroke, one more pedal, one more step. small achievable tasks." - Sarah Stewart, member of the Greenwich Tritons. I went to a talk about preparing for race day a few weeks ago and one of the things that was discussed was the use of mantras. I was just like, what? What's the point of that? However, as I got closer to the Dartford Bridge Triathlon, I started to panic. Had I gone a challenge too far? I was worried I'd let my tri club, the Greenwich Tritons, down. I knew this worry was silly, but the whole triathlon started to get to me, started messing with my head. I went out for a run that involved eight fast 1 km laps and by the end of it I wanted to throw my running shoes out the window. I even started to have bad dreams about triathlon. However, by the middle of last week, things started to turn. Sarah sent me a message with the words above. To begin with, I thought, One more step? Is that really going to help, especially if I know that I'm going to have to do several hundred more? Coach (from the club) told me that exercise would help my sleep patterns. I went out on Wednesday night for more 1 km laps and I felt better. One more step really did help. I coped with the puncture in my commuter bike tyre by getting a new tyre and fitting it myself, and I even slept well. I read the post from triswimcoach, and realized, I'm not racing this for anyone else, I'm racing this for me. All I have to do is complete it, and I will guarantee I get a PB (given I've never done a standard distance before). The day started a little misty but well. I'd even managed to sleep through the night, a surprise for me who normally wakes up at 3 or 4 am and then can't go back to sleep. Then again, the alarm did go off at 4:05, but for a change I didn't feel bad, or nauseous, which I normally do at that time at the morning. I even managed to force down a bowl of porridge and a cup of tea before I left the house. I'd packed everything on the Saturday and all I needed to do was make up my sports drink and put everything in the car, after checking my list for the umpteenth time. We got to Dartford without a hitch and then I noticed that a couple of cars in front of us was one full of bikes. Ah, I thought, I bet I know where they're going. So we proceeded to ignore the sat nav (who was going a bit crazy) and followed them in. My husband Stuart helped me carry everything to the transition, and on our way we saw a couple of our friends who were coming in at the same time. When I got into transition, I looked for a good spot to rack up. Only when I'd selected my place did I notice that they'd numbered the racks so you had to rack up by number. I was 141. As I looked along the rack, it said 139-140-142-143. Where was 141? I went back to ask. It seemed they'd missed me out! But all was not lost, they had a spare rack, and lucky for me, I got to have a massive bit of space and rack all to myself. What a result - my poor friends on the other side were all squashed together! They'd also had to change the number of laps that we did on the bike leg, as part of Bob Dunn way was being dug up because of flooding, so instead of seven laps, we'd be doing eight. I was all racked up and ready to go. I went out to find Stuart and to give him my wedding rings (never wear them in the lake, they could fall off and that would be awful!) and waited around for everyone else to be ready. I heard a couple of calls for people with white hats (which I'd managed to cram on my large head over my ordinary cap!) so was anxious to get to the start point. Finally Nadja came out and we walked to the start. Then they started shouting at us that we only had 2 minutes to the start, so we ran to the swim start. We'd missed the briefing, and weren't really sure where we were supposed to be swimming to! Luckily, a couple of people told us that we went left after the first buoy. The water was incredibly murky - I'd never seen so much mud in my face, but I guess that's because we'd kicked it up on the way to the start. The klaxon went off, and it was time to swim! I went for the first buoy, desperately trying to get myself into a rhythm, probably because I'd set off too quickly. I suddenly realized that we had to go round to the right of the buoy before we turned left, so I had to make a quick change in direction (whoops!). I think I almost swam over someone as well (sorry!). We made it round the buoy, and then we were in the main lake and had to go round the square circuit twice. The first time round, I found someone to swim behind, but I decided they weren't going very fast, so I ended up pulling ahead of them and essentially swimming on my own for the majority. My sighting was pretty rubbish for the first route around until I settled myself down and made sure I had a look where I was going when I took a breath. I finally managed to get myself into a rhythm and swam, trying desperately not to get distracted by the bottom of the lake (it had got a bit clearer once we were out in the middle) or if anyone was behind me. By about half way around the second lap, I got a bit fed up of the swim, I just wanted out of the water. I knew I had to keep going, though, and almost went straight into a kayak on the final exit around (he was probably trying to protect the corner!). As I got to the end, a couple of fast green-hatters (the sprint group?) came past me, and finally I was at the waters edge, feeling a bit disorientated. I just about managed to scramble out of the lake and pressed my watch. 32 minutes for the swim? I was really pleased with that! Definitely a PB for me! Transition 1 was rubbish. I think I was still a little disorientated from the swim, but my husband was gently trying to talk me through it, telling me I was doing really well. Bless him, I really appreciated it. I wasted good time in transition, even putting on cycling gloves that I really didn't need. Finally I got out, and it was time to test out my new bike. Eric is a full-on carbon bike, nice and light for the hills. Not that there were any on this course. There was a gentle downhill, yes, and a gentle ride back up to the start, but nothing really to write home about. The road was called Bob Dunn Way. I couldn't help but wonder all the way round and round and round and round a bit more, "Bob Dunn what?" (I later looked him up. Bob Dunn, rather dully, was a Tory MP for Dartford). On my third lap around, I noticed that someone had come off their bike near the bottom of the hill. It's never nice to see anyone come off their bike, but as I went past, I recognized the person lying on the floor obviously in some pain as my friend, Dominique. It's even worse if you know the person who's been injured. When I went back round the loop I passed Stuart and Coach and told them that Dom had come off. As I came past again (after we'd had to make way for the emergency car!) he was up and on the central reservation. I was glad to see there were a few people taking care of him. Another lap went by, and this time another sad cyclist at the side of the road caught my eye. It was Marc, and as I went past him, his front tyre just exploded! Kaboom! It later transpired that his back one had done the same thing and catapulted him off near the start. So I had more news for Coach and Stuart when I went back to the start. By about the sixth lap my legs were starting to ache and my backside was really sore (still haven't got used to my fancy pants new saddle). There started to be fewer people on the track as the fast ones who had gone past me (and made me polite and get out the way, should have been racing, tut!) finished their ride. It was a lot nicer once everyone had gone, but by the seventh lap I was getting a bit worried. My Garmin only told me I'd done less than 30 km - but wasn't this a 40 km course? As I came round on the 8th lap, I was like, I'm sure this is number eight, but why am I only on 30 km? There were about maybe 10 people behind me, including Penny, and we cheered at each other as we went past each lap! I thought, this is wrong. I can't have another lap if there are so few people left on the course. I was also getting quite sore now, and fed up of being on the bike. I thought to myself, well, if the person ahead of me goes into transition, so will I. And they did, so I did. T2 was fine until I forgot to take my helmet off and had to go place it on my bike (d'oh! ), which again wasted time. The run was the bit I'd been dreading - I'd never run a full 10 k properly before. I ignored the water stations as I didn't think I needed water and just thought, well, just try and get into a rhythm again. I started to try and relax into the run and just try and get a good pace going. 10 minutes into the run I realized that perhaps not getting water was a bad idea - it was getting hot and I started to feel like I really needed a drink! I saw a couple of people out with running race belts with water bottles in them and I was really jealous. I also thought about the fact that I didn't think I would need a cap as it wouldn't be that warm - silly me! I saw Alex, Lizzie, Tina, Nadja and a couple of other Tritons out on the course, and we all cheered each other on. When I came back around the first loop, I saw Penny come the other way. She went to give me a high five, and the clap of our hands together was so strong my hand really stung for a couple of seconds! I even said "Ow!". We had to do three laps, and I almost missed the turning off from transition the second time around. Penny's mother and a couple of other people were cheering us on by the bus station which was really helpful. That was about the 5 k point as well. I thought, well, now I have to do that distance all over again. The second loop was probably the worst, I was tired, really thirsty. I ran past Stuart and asked if I really had to do the loop again? Of course I did. I made sure this time I grabbed two cups of water from the station before I set off round again. My last lap, thank goodness. I was tired, hot, and the guy with the massive beard that I noticed on the bike ride had come past me on the run and was fading into the distance. But Penny hadn't come past me, which surprised me. She was still about a kilometer behind me. Marc had come racing past me, after having had two punctures and a big crash, I was so impressed he was flying round the run! I got round - having avoided a massive lorry going into Sainsbury's - and finally into the final straight. There was my husband Stuart, running along next to me despite the terrible pain in his foot. That gave me the final push to the end, and finished! Looked down at my watch, didn't believe it - 2 hours 59. I'd done my first ever standard distance in under three hours! That was far better than I would have ever planned or imagined, I was thinking more around the 3 h 30 mark! The Tritons after the race, just about in one piece! The guy doing the timing told me I'd come eighth in my age group. I thought, nah, he's having me on. So when the results came out I had a look. I was eighth - out of eight. But, hell, I'll take that!